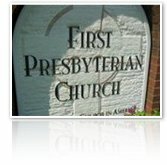 First Presbyterian Church is located in the bustling community of Kosciusko, MS. We are a member of the Mississippi Valley Presbytery in the Presbyterian Church in America. Our purpose is to worship God joyfully by proclaiming the Gospel, equipping the saints, and reaching the lost. We would love to have you worship with us on Sunday morning at 10:20 am for our morning service and at 6:00 pm for our evening service. You are also welcome to attend our Wednesday evening prayer meeting at 6:00 pm. For other events at the church see our calendar. We are located at 603 Smythe St at the corner of Smythe St and Calvary St.